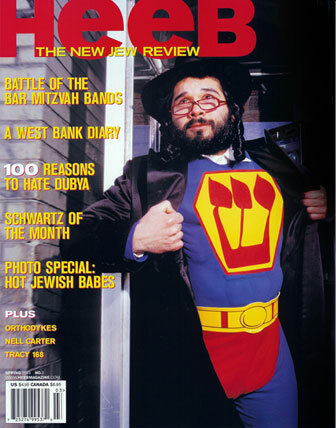 I may be a Jew, but I'm a Jew with a sense of humor and when I found Heeb Magazine online it was as though it was made for people just like me (who knew?). I'm just glad that there are other members of the tribe who know how to take a joke and enough of a market to make it profitable (it is made by Yids after all). Me: "Your Rabbi made it to the Gulit Issue. See 'Frozen Chosen.'" Me: "For amoral rabbis who hire professional killers." Gary: "No. For (as my Dad would say) people who know how to take care of their problems."